CiviQ is an online public consultation tool that enables all stakeholders to make responses, submissions and comments on a range of public sector planning proposals. By encouraging collaboration in this way, the system not only delivers more transparent consultations via an abundance of powerful data that can greatly enhance decision-making, it ultimately enhances planning, policy-making, dialogue and trust. The CivIQ platform is designed as a user-friendly tool that’s easy to use and can seamlessly capture, track, and analyse opinions on emotive public issues, including those being discussed in social media. Also, it allows the public to query this information in real time, in a very transparent and open manner. 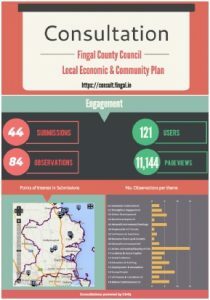 “CiviQ helped us deliver a more open public consultations platform where submissions can be captured and queried across time, place and theme” Dominic Byrne, Head of IT Fingal County Council. CiviQ Submissions – This is an open public submissions platform where information can be queried across consultations, region and theme, and it also includes map commenting. ‘CiviQ Submission’ represents a completely new way for Councils to communicate and capture the opinions of people who have an interest in a particular development. CiviQ Perspectives – This is an opinion analysis platform that shows all opinions on a certain issue, including submissions, media, and social media. The platform can reveal interesting perspectives that might otherwise have remained hidden in previous reporting mechanisms. CiviQ Deliberation (alpha) – This incorporates real-time shifts in opinion during public deliberations; will be used by public organisations when a controversial policy is being negotiated. Finally, CiviQ intends to promote a new approach to conflict management and decision making in complex, highly important social issues, improving critical thinking, context-awareness of user opinion, and exposure to alternative points of view.